It is a little ironic that I am posting my average weekly schedule on the Monday of a 4 day week... pssh details! Regardless, it is the beginning of my 3rd week of 2L year and I am finally feeling like I am back in law school gear. 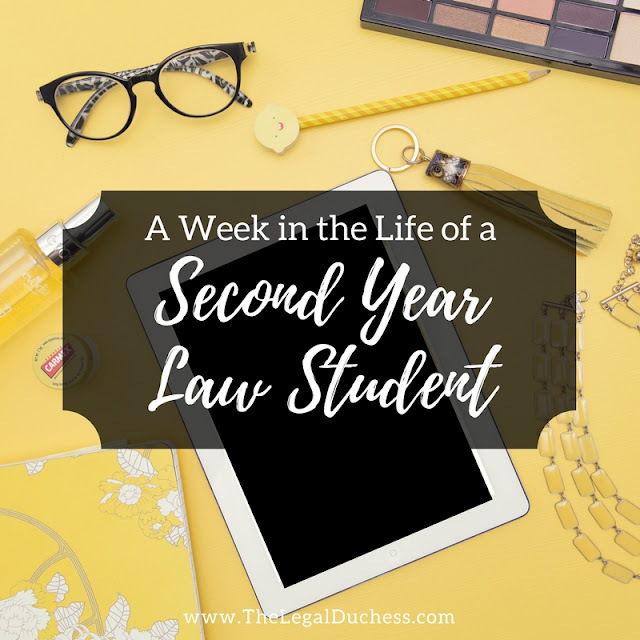 The first two weeks were a little tough just getting back into the law school groove and figuring out how my schedule needs to work. Not to mention I came down with a horrible stomach virus and was sick off and on for the entire second week and missed my first ever law school classes as a result :( I finally feel like I have life organized and a routine that works. Without further ado, here is a snapshot into a week in the life of a second-year law student, Moot Court member and student representative for law school admissions. 7:30- Wake up, Shower, get dressed, eat breakfast, play with puppies and get ready for class. Saturdays are for sleeping in around here! Usually, my husband makes us a big breakfast and we lounge around the house most of the day or go find something fun to do. I try to take most of the day as a break from law school but sometimes I have to break out the books for a few hours during busy times in the semester. Sometimes we go visit family or do something else but generally, Saturday is a day for rest, relaxation and some quality time with each other and our 3 pups. Sundays we usually sleep in again and then tackle the house cleaning. After that, we spend some more time together and then get started on homework and prepping for the week. I usually take a mid-afternoon break to meal prep and go grocery shopping. We cook up a nice dinner and then it's back to the books to make sure I am ready for the week and all my reading is done. The more I can get prepped and organized on Sunday, the better I feel heading into the week. So that is a generalized outline of what my weeks look like. Obviously, life is crazy and sometimes things change but I do find that a routine helps me to stay organized so I try to stick to this roughly. This week is irregular because I have no class on Monday so I am spending it hanging out with a friend, cleaning out my closet to make room for fall clothes and getting jump started on homework for the week. I find it very important to keep a balance between school and regular life and as a 2L, it's hard but not impossible to find time for both in my weekly schedule. As finals get closer, this schedule becomes a lot more focused on studying but for now, this works. One thing you did not see on my weekly outline is blogging. This is because I never parcel off specific time to blog- because this is a hobby and creative outlet, I simply fit it in whenever I have a little spare time, while dinner is in the oven or when I need a break from casebooks. Some weeks I have more time for it than others but it is somethign I enjoy so I try to at least make a little time for it each week. Enjoy this short first week of September!